As the JTA news service reports today, "Christians United For Israel, a pro-Israel evangelical group, features on its website a photo of Jerusalem with the city's holiest mosques wiped out." The JTA story actually misses the nub of the controversy ; the Dome of The Rock, considered the 3rd holiest Islamic site in the world, has been removed from the image of the Wailing Wall and environs featured in CUFI's website logo. The symbolism inherent in the logo casts a disturbing light on the tactical alliance between American Jews and CUFI founder John Hagee's new political lobbying group. The possibly incendiary nature of such symbolism to the Islamic world raises the question of why American Jewish groups and leading American politicians have associated with a leader such as John Hagee whose political views would be considered within Israeli society to be out on the extremist or even violent political fringe. As a possibly intentional provocation, the elimination of the Dome Of The Rock from CUFI's website logo is consonant with John Hagee's repeated vilification of Islam. But is it consonant with US foreign policy or the foreign policy positions American Jews would choose to support ? The troubling nature of CUFI's logo raises the issue of the extent to which Hagee has been granted a place, recently, on the American national political stage and of his access to prominent US politicians. CUFI's founder, Texas megachurch pastor John Hagee, spoke before a substantial portion of the US House and Senate, as a keynote speaker at the Israel America Public Affairs Committee convention in Washington DC in February 2007, and Hagee routinely enjoys private meeting with top members of the GOP such as Senator John McCain and House GOP Minority Speaker Roy Blunt. John Hagee has also repeatedly discussed, publicly and in his writing, his belief that, because history is unfolding exactly as described in Biblical prophecy, the destruction of the Dome of The Rock and the subsequent rebuilding of a Jewish temple on the site is inevitable. Whether intentional or not, CUFI's website logo depicts such a future, in which the Dome of The Rock has apparently been destroyed and this raises questions about the growing tactical alliance between Jewish lobbying groups such as AIPAC and John Hagee's burgeoning national CUFI lobbying group ; ostensibly, Jewish Americans are allying themselves with CUFI for the benefit of Israel, but CUFI leaders have come out in categorical opposition to Israeli land-for-peace deals with the Palestinians and have even publicly claimed to have played a part in disrupting peace negotiations. CUFI's Christian Zionist leaders, rather than seeing peace, seem to endorse an Israeli posture of maximal military confrontation and during the Israeli army incursion into Lebannon, in the summer of 2006, Pastor Hagee described the incursion and Israeli bombing as a "miracle from God". But, Pastor Hagee's, and CUFI's, political positions have no counterpart within Israeli mainstream society. Rather, such views are held, in Israel, by groups considered to be on the extreme political fringe. A veteran Israeli journalist consulted for this story stated that, in mainstream Israeli political sentiment, actions, conspiracies, or even thoughts concerning the destruction of the Dome Of The Rock are considered "abhorrent" and repeatedly stressed the extremely marginal nature of such beliefs within Israeli society. 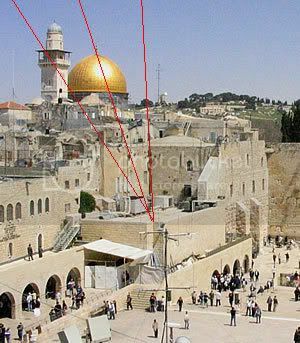 In Israel, the destruction of the Dome Of The Rock is a centerpiece goal of indigenous terrorist groups, but within American politics the idea has become sufficiently mainstream that leading American politicians have eagerly sought to curry the political favor of religious leaders, such as John Hagee, who say they look forward to the destruction of the Dome Of The Rock. 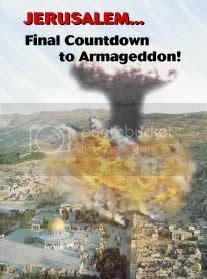 Such an event would enrage much of the Islamic world and could provoke the sort of disastrous military confrontation centering around Israeli that apocalyptic Christian Zionists such as John Hagee say they long for. So, American Jews who have made the decision to tactically ally themselves with John Hagee, in the belief that Hagee is the best friend Jews can expect to find in support of Israel, must confront the reality that John Hagee's, and to a somewhat lesser extent AIPAC's, political positions may not represent Israeli mainstream political views but may lie, rather, somewhere between the hard right to the fringe right along the Israeli political spectrum. 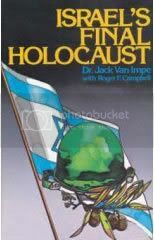 Regardless of John Hagee's noisy declarations of love for Israel, CUFI's leaders appear to support Israel mainly on the basis of the role they believe Israel will feature in their apocalyptic, Christian Zionist end-time beliefs, and CUFI's leaders such as George Morrison and even John Hagee himself have stated that the military confrontation they expect and believe is inevitable, centering around Israel, will kill the majority of Israeli Jews. American Christian Zionist leaders frequently refer to the death toll from the battle of Armaggedon, anticipated in Christian dispensationalist apocalyptic belief, as a "another holocaust", a "second holocaust" or "worse than the holocaust" and also make comparisons to Auschwitz. In the end, Christian Zionism has, as a political force, sought to preclude and prevent peace in the Middle East, and lately Pastor John Hagee's new CUFI lobby has had great success in entraining American Jews in a coalition that seems bent on war. It is not clear that American Jews desire the sort of maximal war policy CUFI and American Christian Zionists envision for Israel, and it is very clear that most Israelis do not desire war. Will the incendiary nature of CUFI's website logo force a reappraisal of the American Jewish tactical alliance with Christian Zionism ? CUFI's leaders envision a near-term future course of events at the end of which most Israelis will end up dead, with a surviving "remnant" converted to Christianity. The project of forcing God's hand, of hastening the end-times, is generally held, within the Christian theological tradition, to be anathema. Indeed, pastor John Hagee, addressing a group of Jewish bloggers in a recent phone conference, described the project of hastening the end-times as "theologically off the map". But, intentional or not, it is hard to see how CUFI's website logo would have any effect other than to increase religious tensions in the Middle East and John Hagee, along with many of CUFI's leaders, knows full well from numerous visits to Israel what the Wailing Wall and its surrounding environs, which include (prominently) the Dome Of The Rock, look like. The claim that no one in CUFI's organization noticed the absence of the Dome Of The Rock from CUFI's website logo beggars belief. So, American Jews may now have to consider the tactical alliance with CUFI and American Christian Zionism in the following light : cui bono ?. So, what are the structures likely visible within the perspective lines I've drawn within the CUFI logo image ? 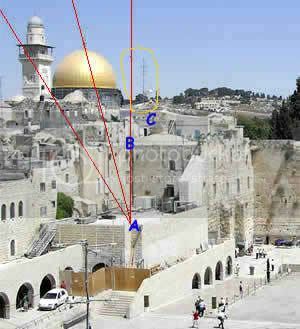 The archway structure visible in the CUFI logo image would likely be one of the archways surrounding the Haram es-Sharif, and the black mass to the left of the archway structure visible in the CUFI logo is likely the base of the Haram es-Sharif. Note that the CUFI logo image is taken from a narrower perspective than the comparison photos I've provided. The CUFI logo image perspective is a highly unusual one and I cannot find a comparable perspective image. The narrower perspective of the CUFI logo image would skew the reference perspective lines, relative to the overview of the Haram es-Sharif I've provided, to the right. 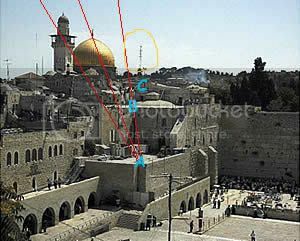 That would suggest the archway structure visible in the CUFI logo image is one of the two to the right of the Haram es-Sharif dome structure. 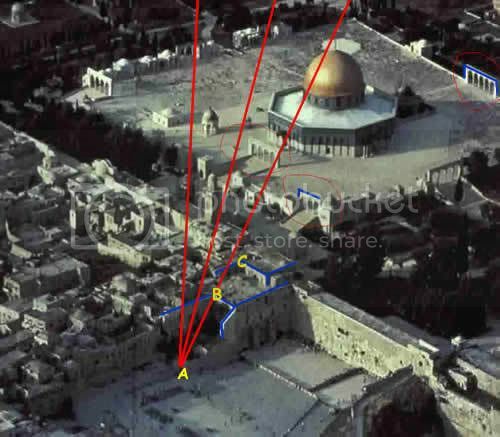 That would seem to fit given the blackish mass immediately to the left of the archway structure visible in the CUFI logo image, which would appear to be the base of the Haram es-Sharif dome from which the dome seems to have been photoshopped. So, what's CUFI ? Here's an intro, from one of my pieces on John Hagee and Christians United For Israel. After that I've posted links to a number of related articles. That leading US politicians now happily appear at public events with, cheer on, and consent to share the stage with a man who advocates a fringe conspiracy theory some would call anti-Semitic and urges a "preemptive" use of nuclear weapons in order to cause widespread nuclear war indicates the extent to which US political and religious culture has lurched far right, towards what some call an "apocalyptic death cult", over the past four decades since the era in which Lyndon Johnson's 1964 presidential campaign devastated Barry Goldwater's presidential hopes by airing just one time a 30 second TV commercial, the "Daisy" ad, that effectively tarred Goldwater as eager for nuclear war. Now, for Republican politicians wooing a key bloc of evangelical GOP voters, public expressions of nuclear blood lust are no longer stigmatized or politically toxic ; they are an asset. Friends Of Israel and AIPAC Envision "Israel's Final Holocaust" and "Jew Toast"
AIPAC Event Helps Mainstream Allegations Of "Satanic Liberal Jewish Conspiracy"
. . that this well researched story will indeed force the long needed dialougue among Jews outside the AIPAC leadership circle. Jews and most Americans believe in Israel. What Hagee has done has fed the very anti-Semitic fear of "Jewish power." Most Jews do not understand how far-right AIPAC is and believe they are well represented by them. It is time that they learn that nothing could be further from the truth and that AIPAC's Faustian alliance with Hagee will be the CAUSE ,not the solution to anti-Semitism. If this story forces Jewish leaders to re-evaluate the motives of John Hagee and CUFI, and if it also FORCES mainstream Jews to learn about all of this. . .(most have never heard of Hagee, nor CUFI, nor Tim LaHaye, Christian Embassy, Rod Parsley,Ron Luce, etc,etc.,etc. )and to understand that the political power CUFI and AIPAC wield will most certainly lead us down the path toward "The Final Countdown," then you, Bruce Wilson, will have opened the door toward peace and co-existence. Hate begets hate. War begets war. And these Christian Zionist racists are to be shunned, not embraced. For that, the world will look kindly upon Jews. If not, God save the world. Thank you Bruce. You're right on target, inmyhop, on the CUFI-AIPAC alliance driving anti-semitism. In fact, that's already underway. I don't want to detail why yet, because publicity might not help. at the fact that JTA calls CUFI a "pro-Israel" group. CUFI is hoping to bring about Armageddon; a war that they believe will be worse for Jews than the Holocaust. If that's pro-Israel, what the hell is anti-Israel? You don't know what "anti-Israel" truly is ! why people like Hagee, Falwell, etc. have such a huge following. Do these followers not have access to a Bible? Where does it talk about the rapture? Does common sense not dictate that if you force an event like Armageddon (which would include millions of innocent lives lost) you break God's laws? But, he also seems caught up in a theological stream that holds otherwise. The Rapture ? - well, Christian Dispensationalism is nearly a two hundred-odd year old doctrine, and we try not to get into theological disputes per se on this site, but you might raise that question on Christian sites given to apocalyptic Dispensationalist ideas. Why does Hagee have such a following ? - that's a complex question. I believe someone posted your article on dkos recently. Great piece of observation. I believe this photograph, coupled with the stated goals of CUFI, along with the kind of political muscle CUFI has been flexing, will be a terribly inflammatory image across the Muslim world. We know that images speak louder than many words. Thanks for staying on the CUFI story. This is something we all need to stay on in the months/years ahead. Will it be available in orange? I wrote this on the fly ; JTA breaking this was unexpected. I've been researching in related areas and wanted to frame this. There's an enormous backstory to this also, and maybe I'll post that on dKos. But, the progressive political community has largely been oblivious to the rise of CUFI and the implications of the new lobby. you need to add more background to a diary for a generalized site than would be part of one part of a diary series here. But your diaries on CUFI have helped put a dent in the awareness of the issues over at Big Orange. In addition, some long-time AIPAC supporters have begun questioning its close ties with CUFI. Challenging Christian Zionism links to a few good articles on the subject (here and here). I wrote this on the fly - I wasn't expecting this story to break and my time was a bit rushed. I'll add more background to this soon.This piece was more of an op-ed. Thanks for the links to "Challenging Christian Zionism" on AIPAC. I'll read those articles. 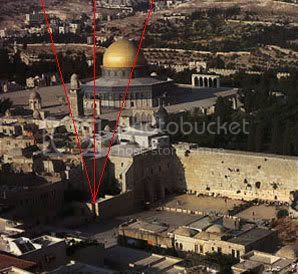 They've also erased the Al-Aqsa mosque to the right; that's the building which a deranged (Armstrongist) Christian Zionist named Michael Dennis Rohan tried to burn down in 1969. A few years ago I visited the International Christian Embassy in Jerusalem; I remember that they sold greetings cards that showed an empty area of the Temple Mount on the far side of the Dome. But, they have the excuse that the gold seal is there ! You didn't, perchance, buy one of those greeting cards, did you ? Or, can I quote you on that ? If you saw them there are bound to be hundreds or thousands still in existence - they couldn't deny they were selling such cards. Also - if you look very closely at where the Dome of The Rock should be in the CUFI logo picture, you'll see a new structure - it doesn't look like any existing structure but, rather, like a construction project or even like a rebuilt temple maybe.... maybe. The most disturbing part of Christian Zionist thought to me is that what certain extreme factions of Islamic thought have done to the Quran is precisely what I see and hear being done to Revelation by these Christian Zionists. The most ardent Zionists have positioned themselves to accept as virtuous and "ordained by Scripture" the very behavior that we decry when Sunni and Shiite Muslims engage in it: terrorism. Please keep doing this work. It's vital to peace and stability!